This lesson will focus on the process of harmonizing the major scale and the resulting chords we obtain. This is a very important lesson so please set aside about 30 minutes at least. In music theory, harmonization is the process of building chords from a given scale using common formulas. 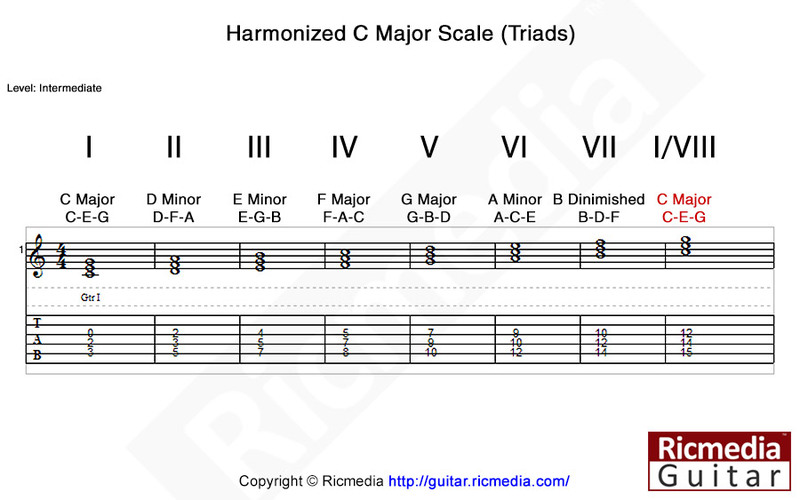 The most common formula is to take the first, third and fifth degrees of a scale when building triads, then move up one scale degree and take the second, fourth and sixth degrees then continue this process until you reach the original chord. This is known as tertian harmony because each interval in the resulting chord is either a major third, or minor third apart. There is also secundal harmony which moves up in either major or minor seconds, and quartal harmony that moves up in fourths. 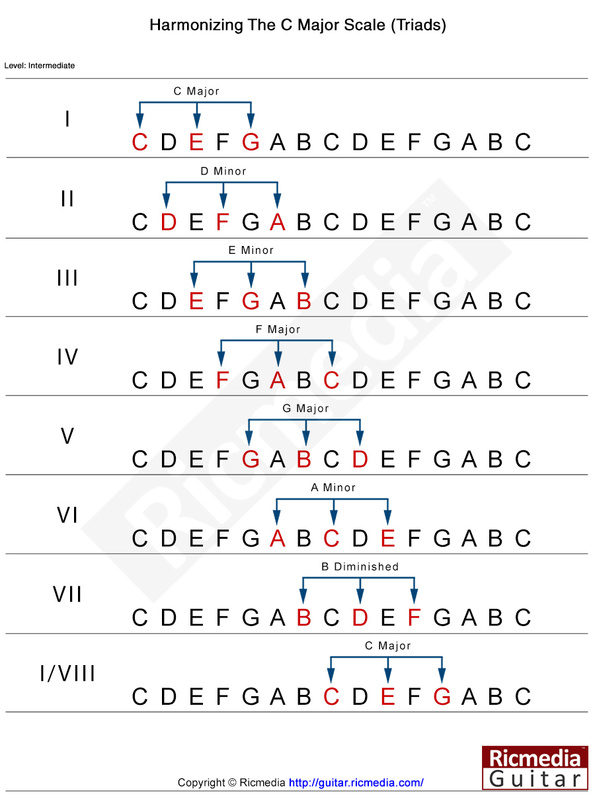 The term triad refers to the fact that there are three notes in the chord, there are also tetrads that have four notes, pentads that have five notes and hexads that have six notes, this lesson will cover triad harmony. To keep things simple, we will be harmonizing a C major scale which has no sharps or flats, so we can focus on the actual harmony rather than keys. Below you will find two charts, the first is more of a visual diagram as harmony is a very visual process, and the second shows the traditional musical notation. Looking at the first chart, you will see a two octave C major scale repeated seven times along with an eighth that is simply the first chord repeated. Looking at the first line, you will see that we take the first, third and fifth degrees from the C major scale which turn out to be C-E-G, and when we play those notes together at the same time, we will be playing a C major chord in its most basic form, a triad. Try to keep the image of those arrows in your mind because all we are doing from here on out is simply moving it up by one note, and playing the resulting chord. So now we slide the arrows up by one note, which gives us the notes D-F-A, if we play those notes at the same time we will be playing a D minor chord. Next we move the arrows up one more note which gives us the notes E-G-B, play these together and you will be playing an E minor chord. Next we move up another note with the resulting chord being an F major, then we move up by one note again and the result is a G major chord. The next note up results in an A minor chord which is also the relative minor of C major. The final result by moving up one note is a little different than the rest, it turns out to be a B diminished chord. If we move up one more fret, something interesting happens, the notes turn out to be a C major chord which means we have gone full circle, and we are now back where we originally started from except one octave higher. Below you will find a more tradition representation of the harmonization process. Looking at the musical notation, you will see that each note is evenly distributed. If we add another note on top of say the C major chord, we will be building a major seventh chord which is a tetrad, or four note chord. You may have also noticed the Roman numerals beside each chord in both charts, this is one way of communicating via the Roman numeral system. You see, after we have harmonized our scale, we can compose a song using any of those chords that resulted in our harmonization process. So when a musician says "lets play a I-VI-IV-V progression in C major", what he or she means is to play I = C major, VI = A minor, IV = F major and V = G major. Is it all starting to make sense now? So now we can play the C major scale using the chords we have built, but if you're still stuck, then play the audio samples below and particularly the all chords sample, these will help your ear understand the harmony. If you have the concept clear in your mind, then the time has come to start to compose a song! You can play any of those chord we built, in any order, but you will find that some combinations sound better than others. I really hope your mind took that great leap forward into the world of chord harmony, but if you are still in the dark, go through the lesson again until you grasp the concept, it’s just a matter of time and practice. I enjoy this harmonizing lesson. Now I can see the trees out of the wood. It makes it clear to me. Thanks.